Day 1: We arrived in Vietnam at 7:30pm local time after a small delay of about 1 hour. After going through the usual hassle of entering a country we found a taxi we could afford and took it to our hostel in the old quarter of Hanoi. The journey was suprisingly nice. Hanoi looked like it was a bustling and slightly run down city (as viewed from the outskirts at night) the houses were really thin but many stories tall and all in sort of a colonial style, it gave a nice first impression. We arrived and 2 men rushed out of the hostel to grab our bags. The taxi was charged in dollars but the change the driver gave us was in Dong and he was giving us a bum rate. One of the guys from the hostel comes out and says not to worry and he settles it for us and we'll pay him back later. We walked into reception and are immediately given a warm welcome to Golden Time Hostel (or as it sounded like the ice cream in Australia - we called it "Golden Gay Time"). They offered us tea and coffee and sat us down with watermelon as we checked in. We were then showed up to our room which was a very large twin room with TV, ensuite and a mini fridge. It was like being in a hotel and the room only cost us $16 a night! Day 2: We started the day at 12pm after a massive lay in. We thought we'd missed breakfast but the hostel owner, Tony, called is and said he'd been waiting to make us breakfast which was really nice. The free hostel breakfast was coffee, egg and bread (although we left most of the egg). We decided to just wander around Hanoi today. We started by a small nearby lake where we stopped at a small monument as well as a lakeside restaurant for a drink and a slice of cake. There was a road in the old town called "The Silk Road", so we had a look in a couple of the shops. We had planned to go to a few museums and monuments but strangely for a saturday we were told they were only open early in the morning. We had a walk to a few to confirm, but sure enough they were all closed. On our travels we randomly bumped into Jake and Helen (from Chengdu and Yangshou). As nothing was open we headed back to the hostel and arranged a trip when we would get back from Ha Long Bay and onward travel to Hue. In the evening we casually wandered round the big market in the Old Town that happens every Saturday. But the evening highlight was sitting on tiny plastic stools made for children outside a photography store and drank their home made beer (complete with slight chemical taste) for only 15p a glass with an Australian and Canadian only to be told after the 4th glass to leave as the police were coming. Day 3: Excitement! We were finally going to Ha Long Bay. This trip was the reason we were visiting Vietnam and after having to take the good with the bad with everything in China, we splashed out on a swish looking trip for 3 days and 2 nights with Paloma travel. We had our eggs and bread breakfast at the hostel by the ever friendly staff. At 8am we were picked up in a new mini bus and taken first to the office to pay the balance, then we started our long drive to Ha Long Bay. We had a toilet break and rest stop on the way, that took us by surprise as it was a huge shop where everything was massively overpriced. They forced you to go in by saying that they'll pick you up at the exit on the other side of the store. We weren't the only ones though, it was packed with other tourists all doing the same thing. We finally reached Ha Long Bay after about 3.5 hours and boarded a small boat to take us to the big ship. The sky wasn't clear and the ever present mist slightly obscured our view, but you could see some of the famous limestone outcrops already in the distance. Alicia and I commented on the unpleasant smell of the harbour and then saw a poo in the water floating by....that'd be why then. As we pulled up to the Paloma boat, it was by far one of the most impressive ships on the water. On board everything is varnished wood and new. We are given a wet flannel to wash ourselves with and head upstairs to the restaurant for a welcome chat and room allocation. We are amazed walking into our room. There was a large bed, complimentary water and fruit and they even made our bath towels into swans. THAT'S when you know it's fancy. Plus, we had windows that looked out directly onto the islands of Ha Long Bay - easily the best room view of the trip. After some time to explore the boat, we headed down to the restaurant floor for lunch. I was looking at the menu and wondering what I should order. The choice was taken away from me though when they started to bring out everything on the menu! It was almost like tapas with rice, noodles, fish, skewers etc all nicely presented and very tasty. After lunch we slowly headed out towards one of the two floating villages that has opened its doors to allow tourists in. Most people opted to take a bamboo boat around the village but, Alicia, 2 girls, an Australian guy and me opted to kayak around. Great choice, as we spent our hour on the water going off the usual trips route, through tunnels in the rocks and around islands that the tours didn't. The tour guide even had to get a boat out to find us as we over ran on time. We headed back to the boat late afternoon for a "sunset party" which we all headed up to the open air top deck to socialise with the others in our group and drink free sangria. Before dinner we all met up in the restaurant floor for a cooking class where we learnt to make springrolls (although we only saw springrolls once in China, they are everywhere in Vietnam) and got to eat our attempts 10 minutes later as the first course of Dinner, which was another massive affair. It was a lot of sea food this time, but it gave us both a chance to try some prawns (specially steamed in front of us) and various local fish. Most of it wasn't too bad actually. In the evening we had a couple of cocktails from the bar before heading to out for a spot of squid fishing. We sat there with our rods for ages, but got nothing (much like our attempts at piranha fishing on the Amazon). After that we headed to bed as we had an early start the next morning. Day 4: Earlier start, at 6:15am we had a 45 minute Thai Chi lesson on the open air top deck as we floated between the outcrops of the Bay. After we had just enough time to shower before a buffet breakfast. Everyone else in our group was leaving today, so we had the entire 2nd day to ourselves! The others went to visit the caves (scheduled for our last day and one of the top things to do in the Bay) whilst we got ready to board a smaller day boat for our trip further into the Bay for kayaking and a BBQ on the beach (which would be deserted because we were the only ones on the trip! Excellent). We were running a little late so had our tour guide knocking on the door saying they were ready to go. A few minutes later we got another knock at the door, the tour guide again but this time with bad news. He said the weather wouldn't be very good for today so we probably wouldn't do all the activities and if we were ok with that. "Fine" I said, "let's go anyway". We headed out to where we had to board the boat. It had started to drizzle, but no major issue. After waiting in the rain for a little and the tour guide shouting across in Vietnamese to other workers he explained that the day boat (still a fair sized vessel) couldn't dock because it was too windy. Gutted! We could see a slight breeze from the rain but nothing crazy. Then the captain came down and said there was a storm coming in and that the main Paloma boat might not be allowed to stay out on the water. We were given two options. We would have to stay on the boat either way, as it was unlikely we'd be able to board the day boat. So we would have to stay on the main boat and if the weather got better we would have to repeat the first day then see the caves as scheduled on the 3rd day with no refund of money, but worse case - the predicted storm came and we'd be stuck in port for the next few days. Poo and all. The other option was to travel back that day without seeing the caves and be charged the full 2 day/1 night price so entitling us to a small refund. We were given 20 minutes to decide. I couldn't believe it. I could see white cloud in the distance, but they were saying that boarding the day boat and waiting for it to clear wasn't even an option. I was so angry at the no-win situation we had. It had happened again, something we'd been looking forward to from the start of our trip had fallen apart. Just like most of China. We both felt so depressed, so just sat in the room in silence for a while. Either way we lose. The tour guide came in and tried to help us make a decision. His advice was to leave. I explained, that why hadn't the captain informed us early so we could have at least seen the famous caves like a full 2 day / 1 night tour? Why had we been asked to get ready and been told they are leaving when clearly nothing was happening today? He didn't know. After some debate Alicia just made a decision and said let's go. At least if the weather was going to be terrible we could mope cheaply. So we set sail for the harbour. The tour guide made phone calls for buses, refunds and to arrange a hostel back at Golden Time. What made it worse though was that the weather had almost immediately cleared up. The rain and the wind stopped and the visibility was better than the day before! Couldn't believe it. Had they been telling us lies? Was it because we were the only ones on the trip? These were all things we later discussed between ourselves with no real conclusion. It didn't matter though, we'd missed the day boat so we couldn't have done our day itinerary and they were still telling people there was a storm coming so the new people coming might not be able to go. We had an early lunch, after we settled bar bills, packed and checked out. We were completely dumb struck and didn't feel too much like chatting. We then had to wait 45 minutes at the harbour office for the bus. When it did arrive, the new arrivals were greeted and shown onto the boat. No talk of a storm. We got on the bus for a long trip back. It did rain a bit heavier for a while on the way back. But then cleared up again - if they stopped service for that weather, they'd be out of business. Of course they then stopped off at the Emporium of Tat on the way back as well. We weren't in the mood to browse. We got back to the hostel visibly disappointed. The reception staff asked if we wanted a drink but then told us they were full for that night but they had booked us into another hostel, which we needed to get a taxi to. In fairness to them, they paid for the taxi and the room was the same rate and quality. But at the time, I wasn't amused. We got into our hostel and crashed for a bit. We were both so disappointed. That wasn't how it was supposed to happened. Now we didn't have anything to do, we didn't WANT to do anything, we wanted to be in Ha Long Bay. As the hostel was more central in the Old Quarter of Hanoi we ventured out later in the evening to wander round. Far from storming, I was able to wear a T-Shirt out. We wandered round for a bit and finally found a reasonably priced restaurant were we had noodles and spring rolls. I had some beers and Alicia had an extra crepe and a couple of glasses of mango juice and vodka whilst we try to make sense of the day. After we head back to the hostel and crash. At least it did have the courtesy to rain a little in the early hours of the morning. Day 5: We didn't really feel any better when we woke up. We had to check out and move back to Golden Time. One of the receptionists (Tony) even rang us to arrange a pick up and to check if we were ok because "we looked sad" the day before. We declined as we wanted to walk round a little more. We walked round Ho Chi Minh Mausoleum and around where the president and other important members of state live. We walked partway round the huge west lake - and stopped off for mango smoothie, then headed back to the hostel to figure out our next moves in Vietnam with help from hostel staff. Day 6: We set off for our trip to Tamcoc at 8.30am. Tam Coc was supposed to be lovely so we were happy to be heading out and seeing something spectacular again. Our tour guide was giving us some information on our trip and facts and figures about Vietnam. He did put us on the turn not soon after though. It started to drizzle, not enough to even wet the floor properly and he said "if the wether is like this, we won't be able to cycle" (1/2 of the trip). WFT!? How does this country survive when apparently they are unable to operate anything if it's mildly damp in the air. Not even raining. The bus was a 2 hour journey. But it had to make the obligatory 20 minute stop at another house of tat on the way. Our first stop on the trip was a small but very nice temple just outside of Ninh Binh in Hoa Lu which was the house of the first emperor of Vietnam and although small, was obviously culturally significant enough, as the Americans bombed it heavily in the war. We don't stay too long, just enough time to take our pictures and have a quick wander. Thankfully the rain hadn't even reached Hoa Lu so we got our bikes from just outside the temple. The bikes were well used, but no issues like in Yangshou. 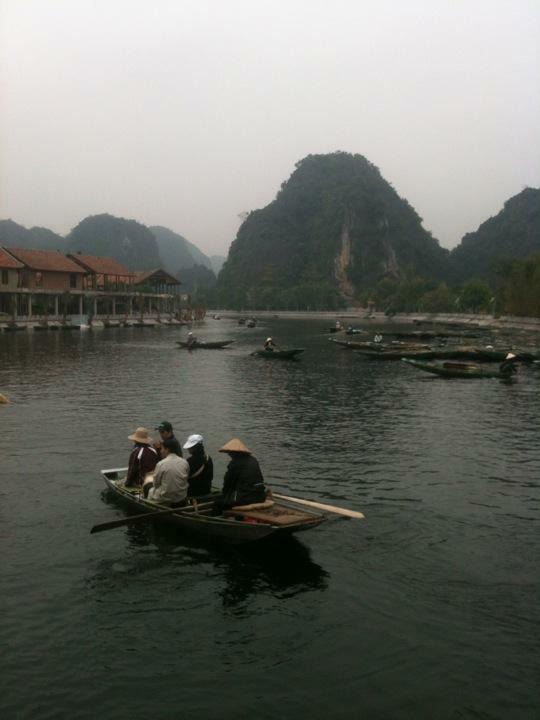 It reminded us a lot of Yangshou as it had similar outcrops and mountains. The cycle ride was more pleasant though, it was over bridges and along deserted but concreted roads. The tour guide tries to gee us along but we take our time, take pictures. Alicia tries not to fall off successfully! Yay. We see Tony and Michael from the hostel too which was random. They were heading back to their home village and stopped when they saw us cycling. Really nice guys. After just over an hours pleasant cycle we reach the restaurant by the river. It's a buffet style (so time to go nuts!). The only meat is Goat, so I tuck into skewers. Alicia is about to bit into her half eaten corn on the cob before she notices a live maggot crawling around. She then bites into a spring roll and pulls out a hair from the middle of it. We both stopped eating at this point. Afterwards, we went on a lengthy boat cruise along the river. It was a small boat with only myself, Alicia and an Aussie guy called Greg. The woman rowing the boat did so with her feet! We traveled along the river through fish farms, people fishing with car batteries and many other tourists. We floated between the mountains and even through 3 natural tunnels in the mountains, all very low and caused me to duck. On the way back she stopped so she could try to sell us the usual selection of goods (paintings, postcards, t-shirt etc). When we were back at shore we all got back onto the minibus but instead of heading back to Hanoi, Alicia and I got dropped off at a hostel/ restaurant in Ninh Binh at around 5pm where we waited for the bus (although still not hungry from the experience early in the day). The bus arrived at 8pm, when we went out to meet it, they said they only had room for 1 more person! After some back and forth a guy from the restaurant came out the help. The guy then disappeared into the bus shouting and moving up and down the bus. After a little time he reappeared and without looking too happy he waved us on. We hesitated, but the guy from the restaurant encouraged us by saying "I sort for you". We head to the back of the bus I see a spot at the back and head to the top bunk, Alicia however gets moved to a the bunk below which is full. She was informed to just squeeze in. She wasn't happy, as I imagine the others on the bed weren't either. One of the guys gave up his bed and sat on the floor so Alicia could sleep there next to the two local guys. After a while one of the guys in Alicia's row got off, and was immediately replaced by a middle aged Frenchman. So Alicia was back in the same situation. I couldn't complain, but I wasn't having the nicest time either. I was sleeping in the middle of the three top adjoining beds. Both were locals, on my right was a very pleasant guy, but he slept with his face almost on my pillow and his knees in my lower back. On the left was a small drunk man who stank of booze and dirt, snored loudly then blew the excess air in my face, slept with his elbow in my head (despite me repeatedly moving his elbow) and would wake up a various points and vigorously scratch his face and head. To top it off Alicia got up to talk to me at one point and noticed cockroaches running in and out of the horrible smelling toilet (located besides our heads). Needless to say when we got off at our destination, Hue, in the morning, we hadn't had the best nights sleep in the world.